Member of Social Work Oncology Group and Association of Oncology Social Workers. 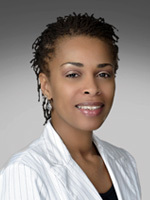 Tonya is a certified Oncology Social Worker with over 10 years of experience in oncology. She is passionate about providing quality care and support to patients and families during such a challenging journey. Tonya enjoys traveling and has a personal goal to experience firsthand the natural and manmade wonders of the world. She is passionate about self-expression through poetry, both written and spoken word.